The Access Fund and Red River Gorge Climbers’ Coalition (RRGCC) are excited to announce they have combined forces to offer joint membership. Climbers can now join and support the Access Fund and RRGCC with a single membership. This new combined membership allows climbers to support national climbing access efforts and Red River Gorge access efforts with a single membership donation. Unfortunately the peaceful environment I recalled from my last visit in 2011 has been completely altered due to the construction of a huge parking lot and an elevator that will transport people from the parking lot to directly below the arch. I had heard about this from friends and had quietly accepted it as yet another example of how the local governments try to encourage tourism via huge building developments, yet this development is often too ephemeral for the villages in rural China and probably jeopardise forever a beautiful and complex natural environment. How long the northern Grampians will remained closed is anyone’s guess. Parks Victoria will have to go in and assess the damage and replace any critical infrastructure. In the meantime, it is important that climbers not climb in closed areas. Last year quite a few climbers ignored bans on climbing and bouldering in the Victoria Range, a fact that did not go unnoticed by Parks Victoria, and we have already heard reports that climbers have been found by Parks staff climbing in Summerday Valley. I think if climbers took a moment to learn more about what we do, how much we accomplish, and how small of an organization we actually are, a lot more people would join and see their $35 membership as a bargain. Fact is, the majority of our funding comes from individual climbers. If climbers didn’t support us, we wouldn’t be here, period. One of my favorite things is when a climber who has known about us for a long time, and thinks we’re big and powerful, comes to visit our office. There is often a look of surprise and slight disappointment on their face – they can’t believe how small we actually are but they don’t want to offend me by saying so. So funny. We definitely punch way above our weight, which I’m really proud of. 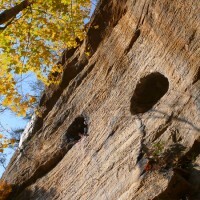 We are doing a lot with a little, so climbers should be confident that their money is being used wisely.